All instrumentation carries the CE marking: a marking that’s not only mandatory for all European manufacturers, but a guarantee for quality. Because of the extended knowledge of our engineers we are able to discuss the applications with the end-user in detail and contribute to the allover engineering of the project. The engineering aspect is a vital part of our service. Clamp-on ultrasonic flowmeters are imported from the English manufacturer, Katronic Technologies Ltd., which has an excellent reputation for quality and reliability. The most famous, Shaw Moisture Meters from Bradford, UK supply their very well-known dew point meters and sensors. The Shaw dewpoint sensor was developed mid-20th century by Mr. Leonard Shaw and hasn’t found its match yet. The dew point monitor, meters, and transmitters are still relying on the same dew point sensor concept. Although, the use of borosilicate glass, titanium, and Hastelloy are no exception. Exceptional flowmeters are the inline ultrasonic flowmeters Atrato series 700, allowing for extreme low flow measurement at constant high accuracy over the whole range. These low flow meters are equipped with a selectable analogue output, two pulse, a hard-wired relay output, and optional display. 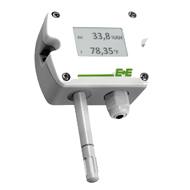 It is the most versatile extreme low flow flowmeter on the market today. Relative humidity, air velocity, and carbon dioxide transmitters are designed and manufactured with German engineering in full force. Reliable, accurate and long-lasting are the characteristics of the products of E+E Elektronik. The uniform concept is recognizable in each and every product. The high standard of measurement of physical quantities is perfection. Measuring relative humidity is in a realm of its own. With a very tiny, thin sensor, a polymer on a glass substrate, the difference in capacitance caused by the change in humidity is determined in order to output the relative humidity accurately. E+E Elektronik is one of the leading manufacturers of humidity sensors in the world, and we’re proud to carry their products. Over the years, JLC International has emerged as one of the leaders in the industry. Not only will you find a plethora of information on our product pages, but you’ll also find we update our blog with all the latest news about our industry and products. Our specialists work out of our headquarters in New Britain, Pennsylvania, and our engineers and other team members are always available to communicate with both current and potential customers by phone, email, or fax. To learn more about our high-quality industrial flowmeters, or any of the other products we distribute, please browse our site or fill out a contact form, and someone will be in touch with you shortly.